We measure temperature with the Advanced Piston Corer Temperature-3 (APCT-3). 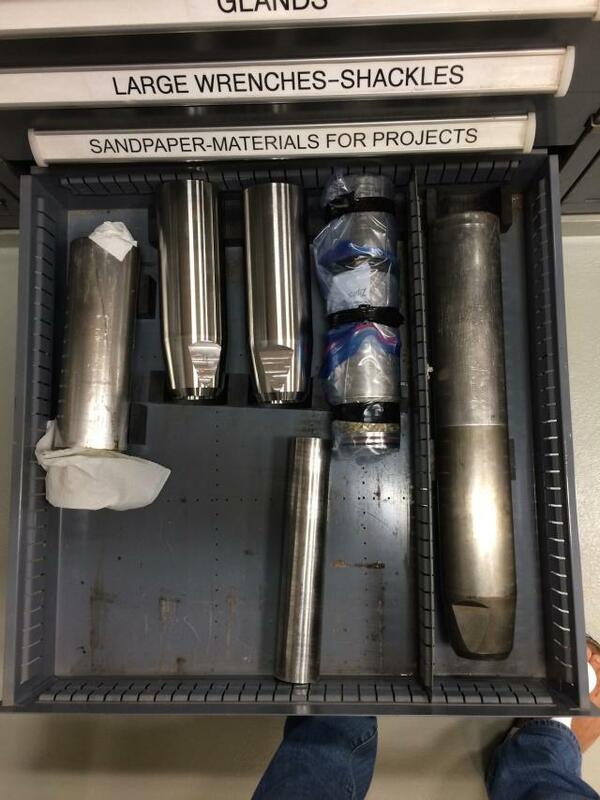 The APCT-3 is used in soft sediments similar to most of the core material we have encountered so far. The instrument obtains formation temperatures. 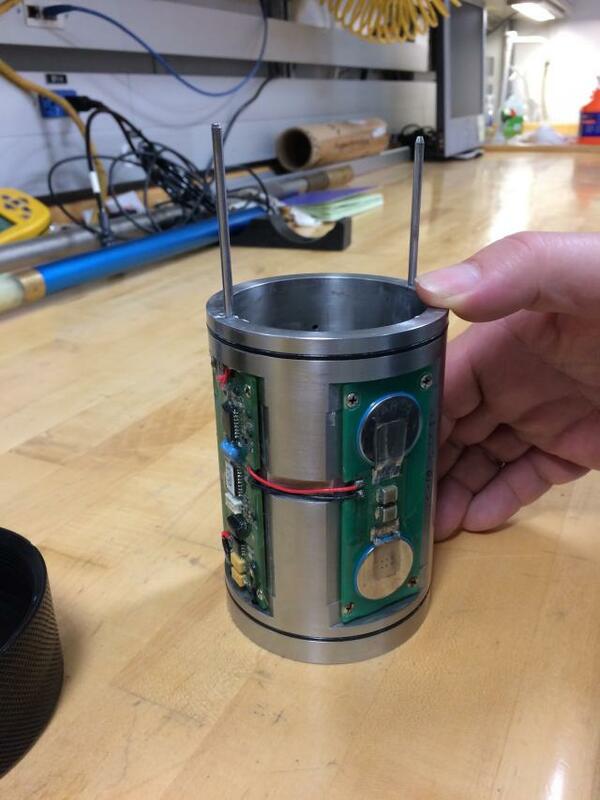 These temperature measurements are used to determine the temperature gradient (how much the temperature changes with depth beneath the seafloor). This is essential for determining hydrocarbon maturity for pollution prevention purposes. For example, a change to large temperature gradients could be an indicator of oil pockets and a sign to discontinue drilling. The APCT-3 is attached to the APC core barrel and is hydraulically stroked 9.5 m into the sediment where it remains stationary for about 10 minutes. The temperature measurements are made by the sensor (two prongs in pic on the left). After the APC inner core barrel is retrieved, the measurements are downloaded. 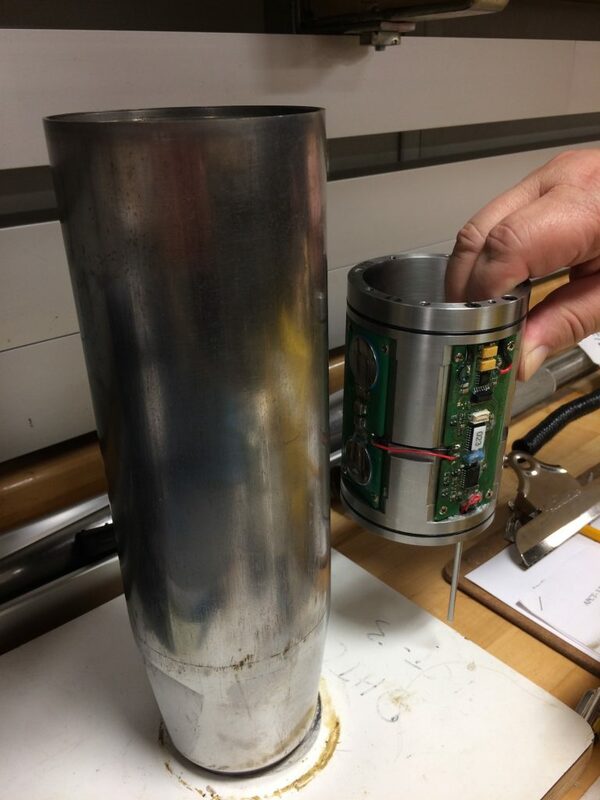 Pic on the left shows the sensor next to the barrel that it sits in. This is a close up of the two prongs of the temperature sensor. Bottom pic: Drawer with APCT-3 spares. Note, how banged up the one on the right is from repeated use. These have to be screwed on and off the bottom of the APC Core Barrel.